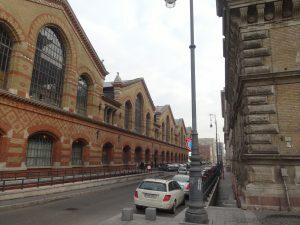 The Central Market Hall (Központi Vásárcsarnok) is the largest indoor market in Budapest. Built at the end of the 19th century, the market is one of five large markets in Budapest all designed in the same style and constructed around the same time. The Central Market Hall was so named because of its central location, and its proximity to the Danube allowed ships to unload quickly. The five markets (Központi Vásárcsarnok, Klauzál tér, Rákóczi tér, Hold utca, and Hunyadi tér) were all opened to the public on the same day, February 15th 1897. 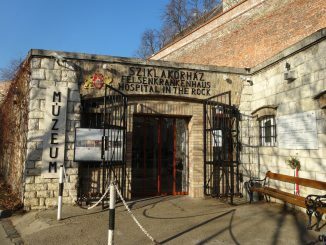 The arched front entrance, and mixed use of decorative brick construction welcome both visitors looking for tokaji or paprika, and locals buying salami and cheese. 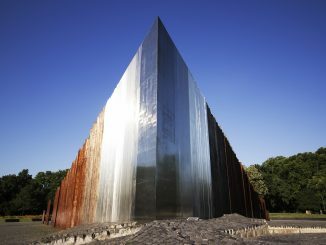 The original metal roof of the market remains largely intact, and the decorative Zsolnay tiles that cover it are beautiful and seen all over the city. 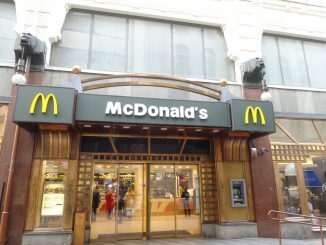 The building was designed with tunnels that allowed vendors to move cold meats before refrigeration but they are no longer in use. 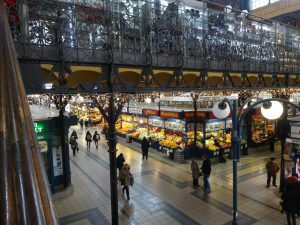 Wide aisles and beautiful metal and wood staircases give the feeling of being in a piece of living history, but the market has continually updated its electrical grid, refrigeration, and heating while preserving its history. With three floors, there is a variety of items ranging from slotted spoons and tourist trinkets on the top floor, to pickled vegetables and public transit access on the bottom floor. 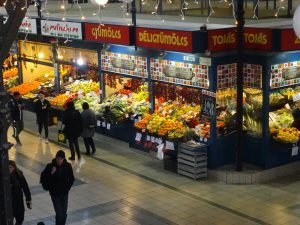 While the majority of daily shopping takes place on the main floor with its fruits, vegetables, meats, and beverages, it is the bottom floor that gives you the best understanding of what it is to be Hungarian. Reminiscent of a time when fresh vegetables were not available year-round and harsh winters required the pickling of produce, it is here that Hungarian cuisine has its roots. 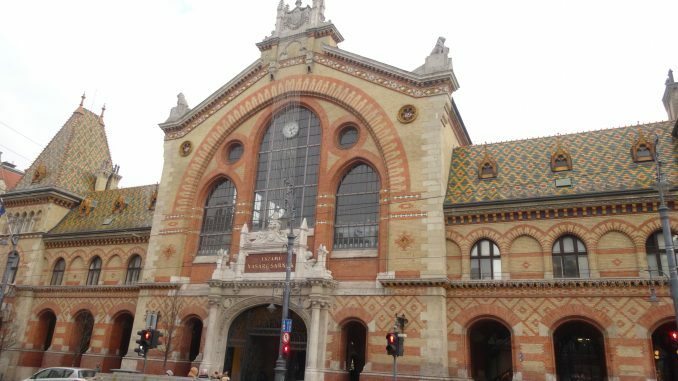 The Central Market Hall remains on the must-see list for almost all tourist guides to Budapest and is frequently visited by foreign dignitaries as well as celebrities. Rick Steves Budapest is a great book that can help you navigate this market with ease. View of ground floor and mezzanine.